Fall is here, and while the days are still warm, the evening temperatures are slowly dropping. It’s a good time to start preparing your home for the cooler months. Taking time to go over a home improvement checklist can save you money and increase your comfort in the seasons to come. The beginning of each season is a good reminder that it’s time to change the air filter on your furnace. Air filters grow dirty and clogged as they do their jobs of keeping dust and debris out of your equipment and helping keep your interior air clean. If you’re needing a new furnace this year, think about getting one of the new ENERGY STAR® models that are rated 90 percent or higher. 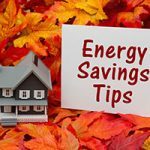 You can save up to 30 percent on your heating costs and will soon get back your investment in energy savings. Check wherever you have caulking and/or weather stripping to see if it’s still intact, with no gaps or cracks. Sealing these leaks can save you up to 20 percent on your energy bill. Now is a good time to upgrade the insulation in your attic, basement, crawlspace, and exterior walls. You can lose a lot of energy through the attic of your home and adding insulation can soon pay for itself. Fiberglass insulation can come in rolls of batting that consist of plastic filaments and glass that are spun into tiny fibers. These fibers are good at slowing the spread of heat or cold (or sound). You can see a residential energy savings of up to 40 percent by installing fiberglass. Fiberglass can be blown in as loose fill gaps and cover spaces that are hard to get to. This is especially helpful around irregular joist spacing in attics, or other spaces that have obstructions. This type of insulation is a good add-on for houses that have existing insulation which might need a little “boost” or a little extra coverage. A trusted local HVAC professional can help you maintain your furnace, fix leaks, and blow in attic insulation to keep your home snug and efficient for the cooler months ahead.